Is Yumeiro Patissiere an anime for you??? This was an anime that one of my anime twins told me to watch and as soon as I started I wanted to watch more! Yumeiro Patissiere is a mixture of Kitchen Princess and Shugo Chara. I loved both of these and my anime twin aid I would love it. And I do of course! I absoutely love the characters, especially the sweet spirits!!! The animation is great and so is the storyline. The music so also good. Overall, Yumeiro Patissiere is a great anime that can be watched by any age. If you liked Shugo Chara then you'll really like this anime too! aweee... best anime ever!!!!!!! yeyyyy!!!! This Anime is the best anime i've ever watched!!! It the story amazes me in a way that everytime I watch it. There's always something good to remember..! When I saw this anime I was immediately attracted to it's kawaii looking theme. It reminds me, and most others, as if it could be a mix between Shugo Chara, Kitchen Princess, Gakuen Alice, and La Corda D'oro. It is very simmilar to Shugo Chara and La Corda D'oro thanks to the little sweet spririts who are like mini cooking instructor fairies. They do resemble the 'Guardian Charas' from Shugo Chara in the sense that they are there to help humans and that they are miniature. The whole sweets theme makes this anime different from both. While La Corda D'oro is about music, Yumiero Patissiere is about Sweets. Yumeiro Patissiere gets a few things right, but tries too hard with a lot of unimportant add-ons that distract us but don't add anything to the story. I call it Kodocha's feeble-minded cousin because the animation style is very similar between the two shows, but the storyline in YP is completely outclassed by the old classic. Where Kodocha has some serious plot conflicts (parental neglect and homelessness, for example) and a truly insane, hyperactive title character, Yumeiro has ancient anime plot devices that we've seen a million times (school princes, card collections), and a lead character that is merely...ordinary. Ichigo is appealing enough as a character design, but there's nothing in her personality or the plot to really hold my interest, at least not for the projected 52 episode series arc. She is growing by leaps and bounds as a cooking student, but her school life story is nothing that couldn't be told about any other middle-school student in Japan. Apart from the annoyingly extraneous supernatural element of the sweets fairies, and the dollop of cooking techniques discussed in each episode, the story is completely bland. plot 1 - Ichigo screws up but manages to fix things up in the end. plot 2 - Ichigo makes a new friend. plot 3 - Ichigo and/or her team mates participate in a cooking contest. Apart from the bland plot lines and lead character, the show holds up fairly well. Sweets prince Makoto Kashino is hyper critical of Ichigo, and has a mysterious, tortured past. Perhaps Ichigo and Kashino's relationship is supposed to mirror the Kodocha relationship between Sana and Akito? The other boys in her group are more supportive and interact with each other as you'd expect. The character designs are appealing and are the one part of the show that actually does reach the level of Kodocha. Plot-wise, romance has not yet entered Ichigo's (or the princes') mind, but it obviously will at some point. A romantic triangle (rectangle?) would be an improvement at this point -- it would add at least some tension to the story arc. But first, the need for a merchandising placement rears its ugly head in the accounting department of the production company. And so, we end up with "sweets fairies" who have to collect recipe cards for their queen. And the little buggers are cheaters. They submit recipe cards for pastries that their partners weren't even involved with. The smells of sweets fairy plush toys and collectible recipe card games drift from the toy-store into the kitchen and overpower the scent of the pastries the kids learn how to make in each episode. This is a shame, since the "educational" element of the baking trivia in each episode is one of the more interesting parts of the show. Neither the fairies nor the cooking trivia have enough muscle to really carry the series around, though. The idea of fairy helpers isn't any different than in Fairy Musketeers, but there is one important difference -- in Fairy Musketeers the fairies are central to the plot and most of the plot conflicts involve them. In Yumeiro, they're just a tacky add-on, like a pink flamingo on the director's lawn. The opening theme (at least for these first episodes) highlights the "cute" aspects of the series and is another strong point, relative to the story. It definitely sets the expectations for the series in the right direction: cute but empty-minded. If there's any other music in the series, I didn't even notice it. With all the bad-mouthing of YP, I have to say that it's still a watchable and enjoyable series. It's not as good as Kodocha or even Shugo Chara - Doki, but way better than (shudder) Shugo Chara Party. I'll probably watch most, if not all the episodes. Plain white bread is enjoyable too. I was just expecting a rose pound cake. this is a unique anime about a high school for learning to be a patissiere. we can learn a lot about sweets here. 1) I hate parts of ichigo which never learn the basic first or read any receipts to learn making any sweets. normally when people try to make foods which they never make before, people will learn the receipt first, how to make it or learn the basics. she thinks she only need lots practices to improve her skills & it's find to immediately try making an sweets without learn the basics first, but always ends up depend on the 3 boys or vanilla for learning basic or her mistakes. she's seriously dense that she never realize the meanie girls from group B hate her for being in the A group and bully her because of that. instead, she wonders herself why those meanie girl copy her cake for the birthday girl in kindergarten in ep 7. she totally dense never realize when she's often being bullied by them. this anime made her density goes too far. it should be clear for most of people if they are in her place though. too many anime made their main characters have really dense personality. in reality, mostly people are not as dense as that. HOWEVER... I still LOVE this anime and ichigo!! this anime still has much more good and unique sides than the typical or bad sides!!!! I genuinely love this anime! My friend told me about this new anime that came out and when I watched the first episode, I was hooked! It has a good story which involves cooking. It's one of those rare anime out there that revolves around cooking. This anime is light-hearted and bubbly. Although, it's not realistic the characters and the visuals make up for it. The characters are all loveable except maybe for Koshiro, but towards the end she becomes likeable. There are character development especially when Amano Ichigo works her way up to become a professional patissier with her team. Moreover, Ichigo's character is consistent and she doesn't lose herself. Overall, it's one of those animes where I would re-watch it a lot. There's also a little romance which makes me love this series even more. The animation doesn't have a clean high quality feel, however, they bring the best quality during the cooking process. I also appreciate how they didn't exaggerate a lot of the cooking process. You Should Support Kashichigo. You Will. ಠ_ಠ . 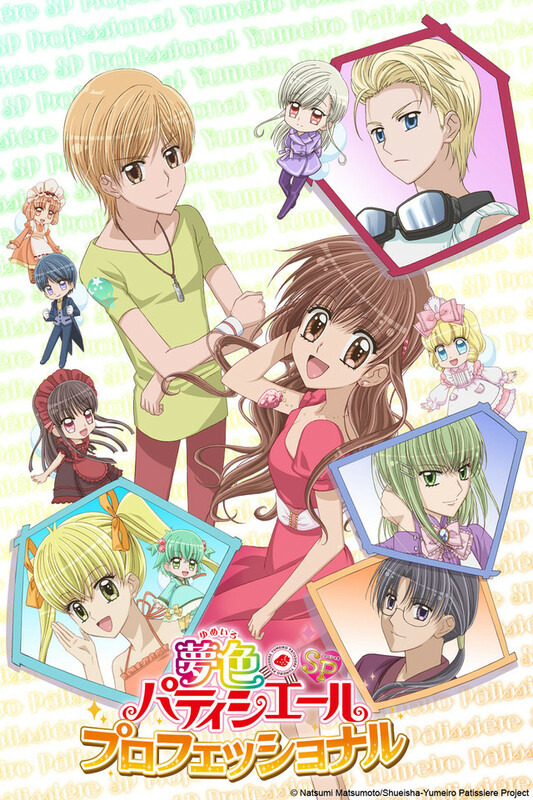 Yumeiro Patissiere is an awesome anime, it reminds me a lot like Shugo Chara!. It`s definitely a must watch series. Truthfully, this anime takes a long time to watch due to all its` episodes, but I promise it`s worth the wait. The eye drawings truthfully isn't the best.. some of the episode plots aren't the best.. but it's an awesome series, trust me. If you don't support them I'll seriously hunt you down, find you, and kill you. ≧◔◡◔≦ Bye now. Don't forget to support the couple Kashichigo, and watch this anime one thousand times because it`s truly that amazing. Storyline: Storyline is common. A clumsy girl discovers her dream and does her best to fulfill it. Some parts of the story are unrealistic. For example, when all of them traveled in Europe, shockingly, a lot of the people they meet are Japanese or knows how to speak Japanese. I know it can be possible in real life but come on, wouldn't that make you wonder too?How they learned Japanese and how they're so fluent and stuffs. However, I like how they put a little bit of romance. Although on the first season, they only showed it on the last episode. On second season, which I'm not done watching, there are romance but only shows on some episodes. As a romance fanatic myself, they should've added MORE romance. It's mostly about cooking and pastries which I don't have a problem with. This series is very informational too! How they talk about chocolates, where the ingredients came from, how they describe the food and what to do to make them delicious. I think the author is a pro patissiere or something. They described details like tempering, differences of sugars, flours and eggs. I learned a lot of stuffs. Music: Well, I don't really give attention about the music of the animes I watch. However, I like the intro song of the second season of this series. I'm into pop kind or electro kind with some auto-tune music. Well, I'm into any kind of music but anyways, I kind of like it. Characters: First of all, I like how they put three good-looking guys with different personalities. That's one thing I like about this anime. There're "good-looking" guys. (Yes, as obvious as it is, I only like animes with good-looking guys. Depends with the anime actually). What I like too are the "sweets spirits". They're really cute. Though, I've seen characters like them like in Shugo Cara and Sugar the snow fairy. Hoever, I think they're the cutest. Animation: Well, I like how they exaggerate the drawing and stuffs (though most animes does). I like the expressions. I'm into exaggerated animation because they make it funny and lively. Like how they make the head big or make expressions like this "^_^ -_-". You guys get the point, right? Anyways, I LOVE how they drew the sweets. It's very realistic and it makes want to eat them. Makes me crave sweets and cakes. Yes, I like food. Voice acting is pretty good. They match with the characters. I like caramel-chan's voice. Overall, excellent anime.